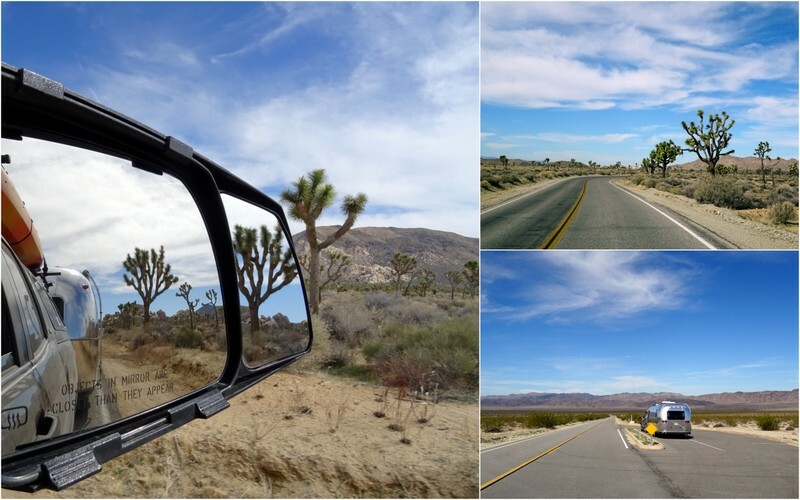 Three winters ago we went on a day trip through Joshua Tree National Park. 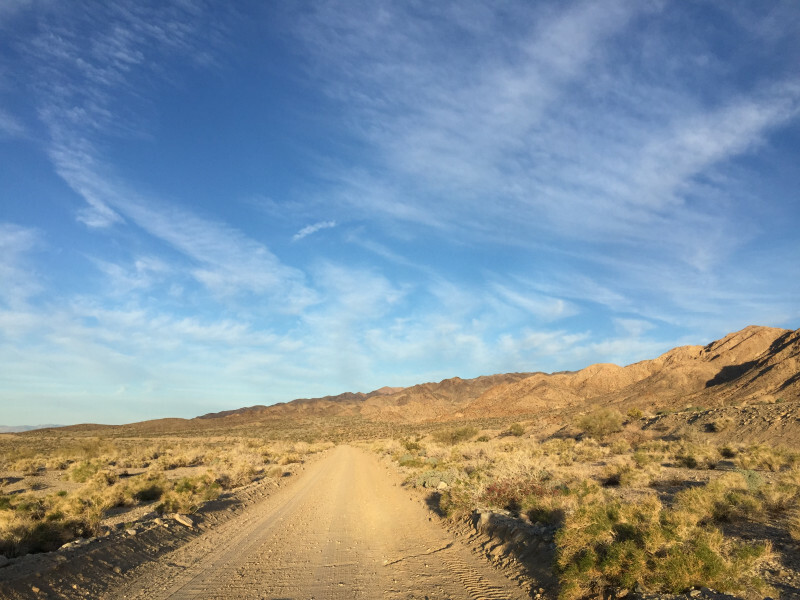 An entire day of driving took us through the park from south to north where we saw Pinto Mountain, strolled around the dense and dangerous Cholla garden, picnicked among the jumbo rocks and Joshua Trees, and even made a detour on the sandy 4×4 Geology Loop. It was an amazing journey that left us vowing to go back for more. 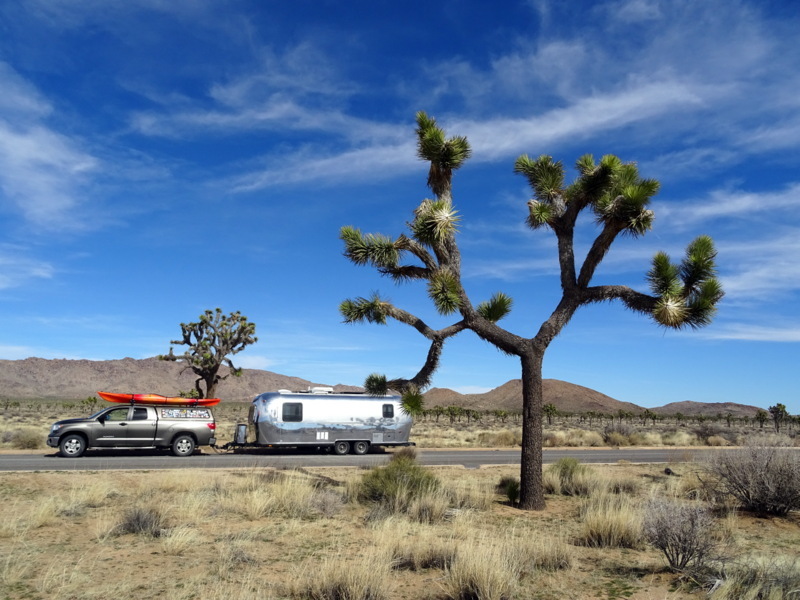 Fast forward to this winter where we found ourselves less than two hours from Joshua Tree. Hmm…seems like the perfect opportunity to make good on our vow to return. We knew that staying inside the park was not an option during the work week due to the lack of reliable cell service, but we also knew that there was some BLM land right outside the south entrance to the park. Free camping less than five miles from a national park? Yes please! This is a well known, easy to find, easy to access, super convenient, super scenic, and super awesome boondocking area. 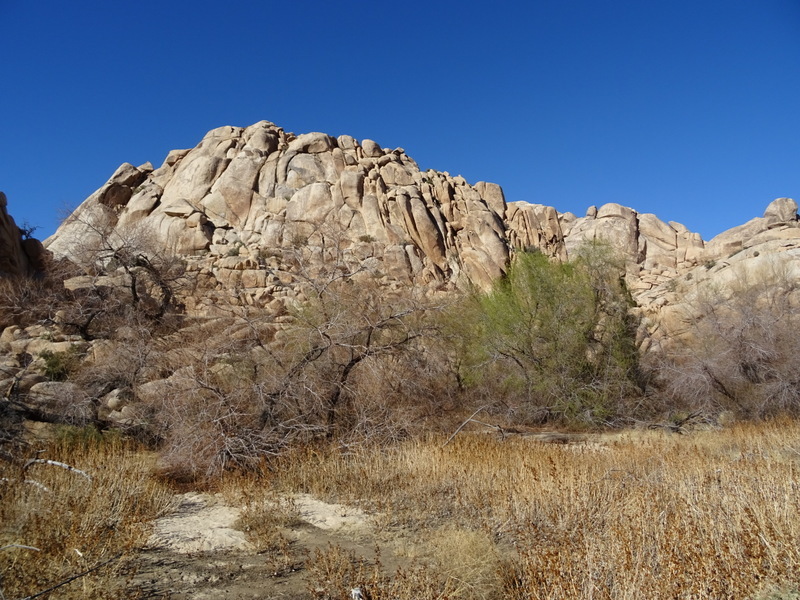 Basically, you get off I-10 at the exit for Joshua Tree NP, follow Cottonwood Springs Rd. for one mile, and then turn either left or right on the dirt road. There are numerous open spots all along the road for several miles in both directions. For GPS coordinates, reviews, and photos check out the listing on Campendium.com. We quickly drove past the beginning of the road where hordes of RVs had clustered (this mentality baffles me, why park like you’re in a campground when there is so much open land?) and found ourselves a gigantic spot amid a cluster of palo verde trees and a towering ocotillo bursting with tiny green leaves. 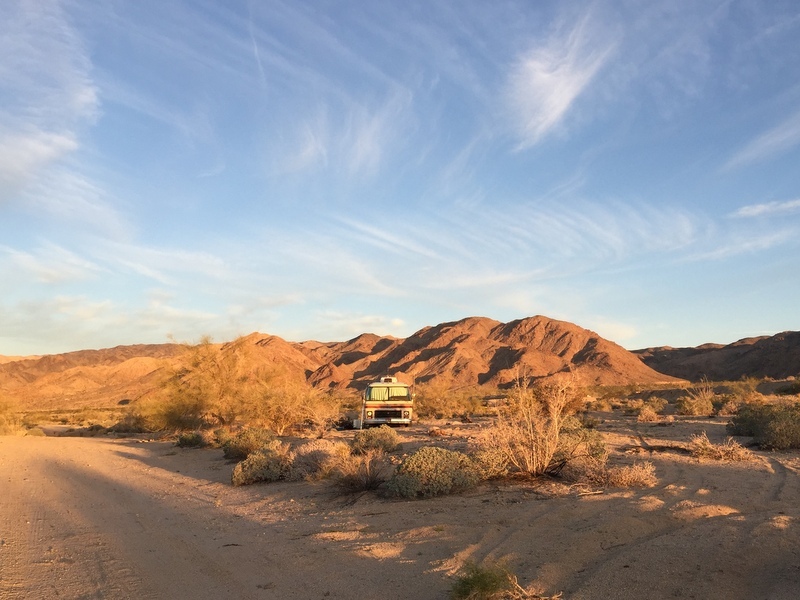 In addition to vast mountain and desert views, we also had the conveniences that make this lifestyle a reality — namely a blazing fast LTE Verizon signal (AT&T works here too, but it’s not as fast), and easy access to a variety of grocery stores in the nearby town of Indio. We stayed for the whole week; taking walks in the desert, soaking up the sun, basking in the glorious warm February temperatures (mid-80s, yes!) and just generally enjoying some down time after the past six weeks of socializing. One afternoon we ventured into the park for a short hike. 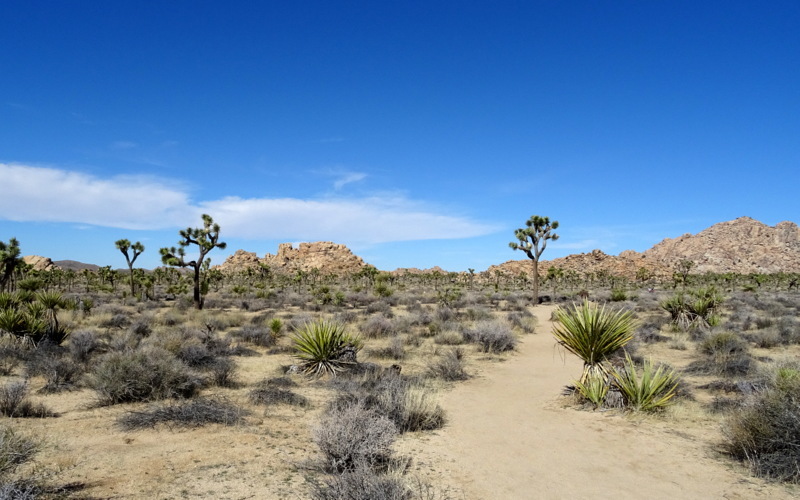 The south side of the park is far less popular than the north side due to the absence of Joshua Trees and giant jumbled rock gardens. But that’s not to say it isn’t a spectacular place worthy of exploration. We set out on the Mastodon Peak Trail which is conveniently located near the Cottonwood Visitor Center only a few miles past the south entrance to the park. 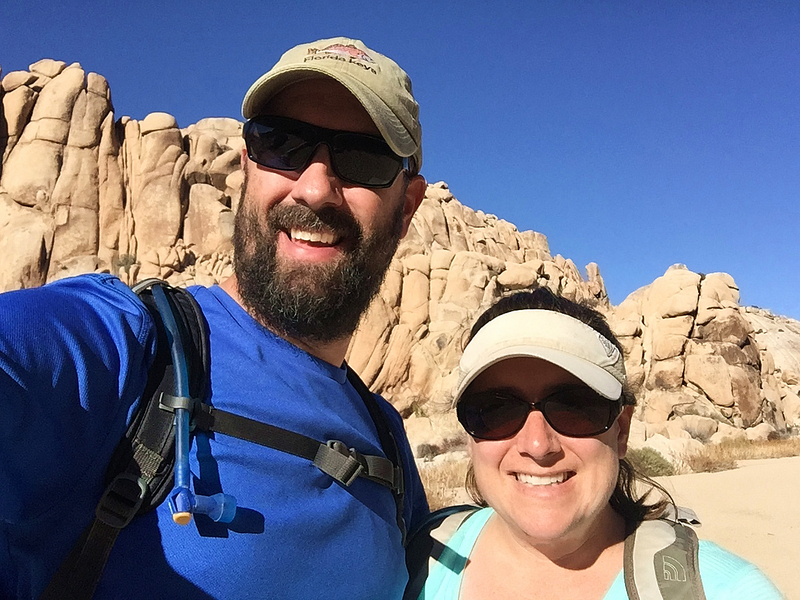 This short hike traversed through the desert and up to a rocky peak with a wide view of the surrounding area including the Salton Sea. It was pretty hazy off in the distance, and the sun was on its way down, so the view was not quite photo worthy, but we enjoyed some great views of the setting sun bouncing off the rocks as we looped back to the parking lot. As the week drew to a close we made a weekend plan to travel all the way through the park, stop for a hike on the north side, and find a place to spend the night before moving on to our next destination. It was bit different this time around as we had our house with us which limited where we could stop. 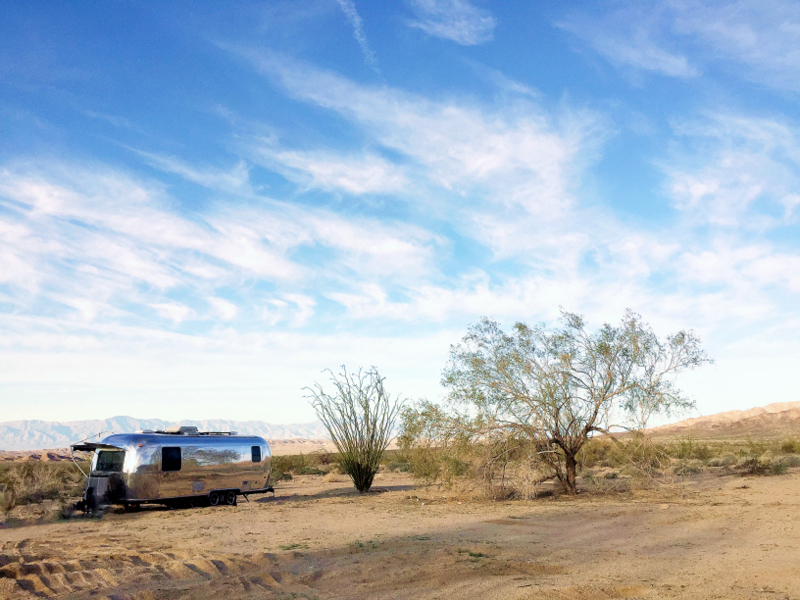 Especially when we reached the very busy northern end of the park where spots to park a truck + Airstream combo were few and far between. We did manage to make a few stops though. We had two potential hikes in mind. Both were around 7 miles long and located near the north entrance to the park. We knew that the final choice would come down to parking options, but what we didn’t know was that that due to the gorgeous weather and it being a holiday weekend (which we didn’t remember until later that evening), finding a place to park would end up being a comedy of errors. After driving past the first trailhead which was overflowing with cars, we past the second trailhead which was no more than a pull-out sized for half a dozen cars, then decided to continue onto the entrance station so we could turn around and go back for another look. Except as we drove up to the entrance station instead of a convenient place to turn around we were met with a loooong line of cars waiting to get in. So we drove about a mile, turned around, got in line and waited 20 minutes to re-enter the park. From there is was back towards the first trailhead to scope out a roadside turnout about a quarter mile from the start of the trail. Somehow we got lucky and there was only one car parked in the turn out which we were able to squeeze in behind. By this point it was early afternoon, so we ate a quick lunch and then made our way to the trail. All in all, it took us about an hour to secure a parking spot. The lesson here is that a holiday weekend is not the best time to find RV parking in a popular national park. 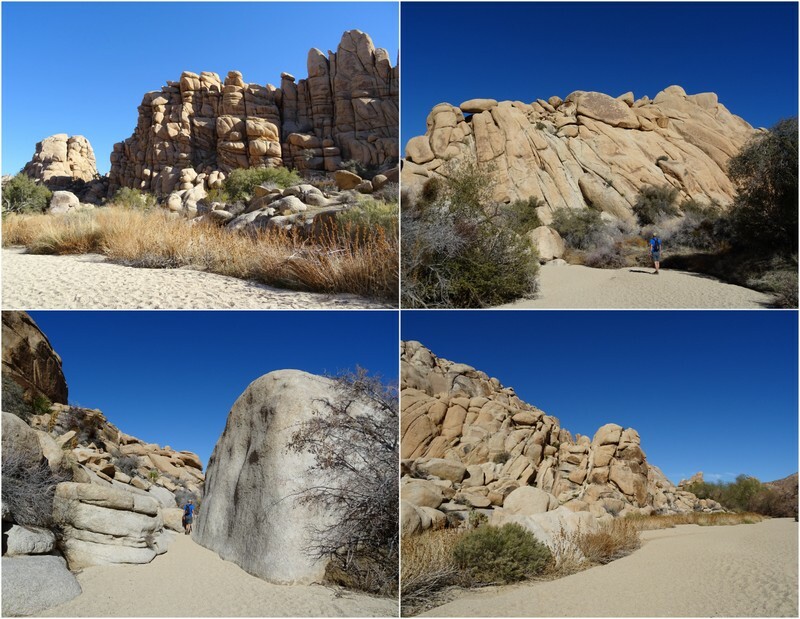 The Willow Hole Trail is a seven-mile, mostly flat, sometimes sandy, trek into an area called the Wonderland of Rocks. 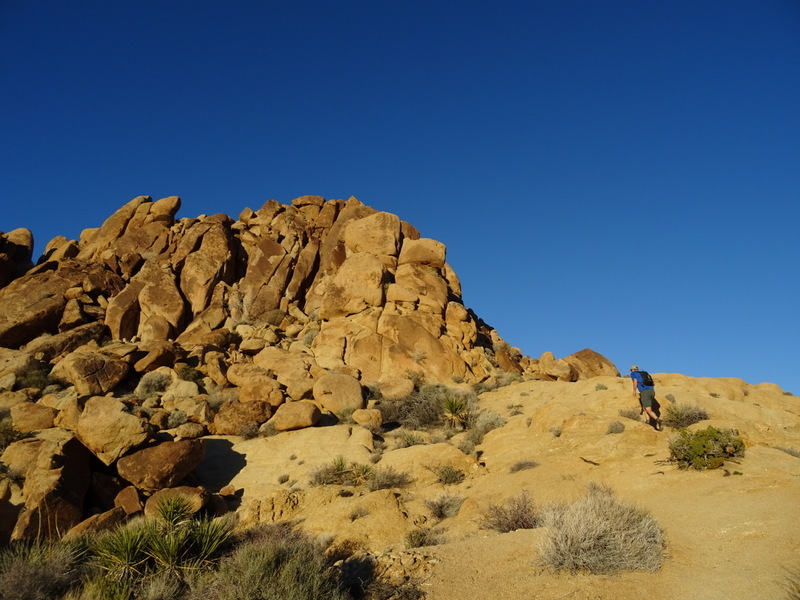 After several miles of walking past Joshua trees, bare shrubs in all their winter glory, and the occasional bright red barrel cactus, we entered a series of sandy washes that led us into the rocks. Whoever named this place “Wonderland” was spot on. The trail ended at a bowl shaped area among the rocks where enough rain water gets trapped to sustain a grove of willow trees. This time of year most of the willows were devoid of leaves, but it was still cool to discover this grove of large trees. By the way, these are Desert Willows (Chiopsis), which are not actually a member of the willow family. They have long slender leaves reminiscent of the willows most of us are familiar with, but that’s where the similarities end. Desert Willows are extremely drought tolerant and produce fragrant pink flowers in the summer. After a bit of scrambling around on the rocks and snack eating in the shade, we turned around and headed back the way we had come. So while once again we didn’t actually stay inside the park, we did enjoy a very peaceful free camping spot, got in a few hikes, and even managed another drive through the park. I would call that a pretty successful return visit all around. Great post. Joshua Tree has always been a source of fascination for me. It is one of a few National Parks that I have yet to visit. Your pictures and descriptions make me want to head west. 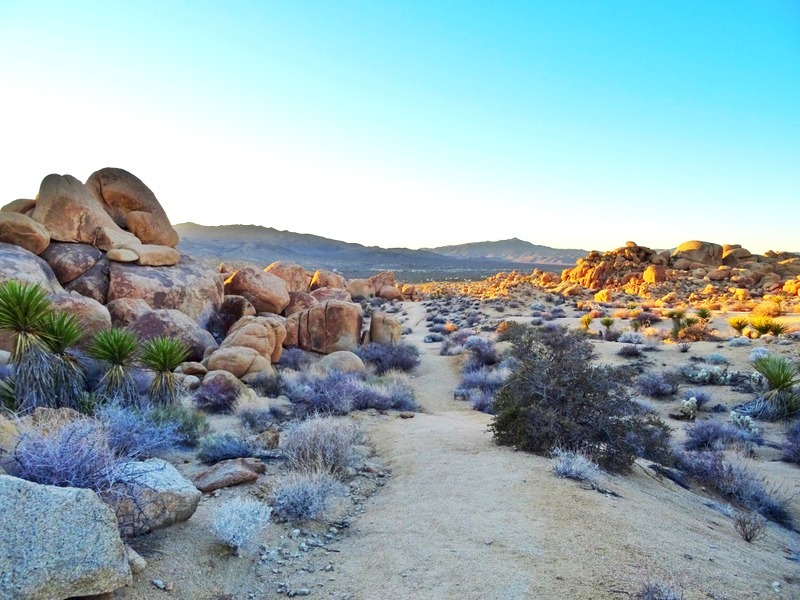 Joshua Tree is definitely one of our national treasures. When you do make it out here try for a spot in one of the campgrounds. If you can get a site they are absolutely gorgeous. 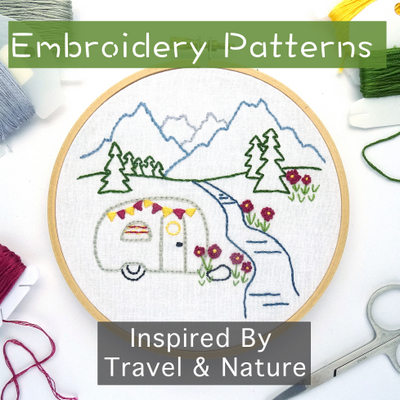 Love hearing about great boondocking sites. You don’t get much for your money in JT anyway and I would prefer the seclusion of being away from everyone else. No I don’t understand why people like camping together either, fear I suspect. 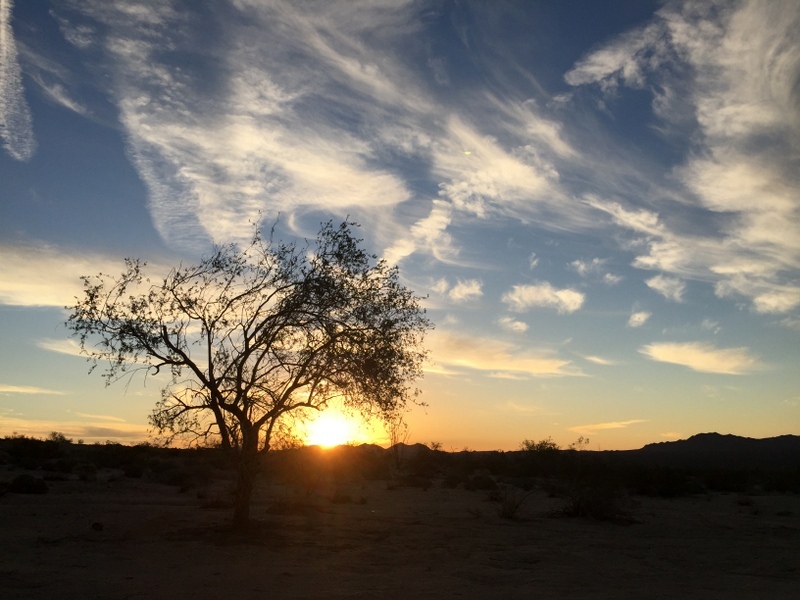 It looks like it would be about an hour to drive to the north side, about how far would it be before you start seeing Joshua Trees because I love to photograph them. It takes about an hour and half to drive all the way through the park. 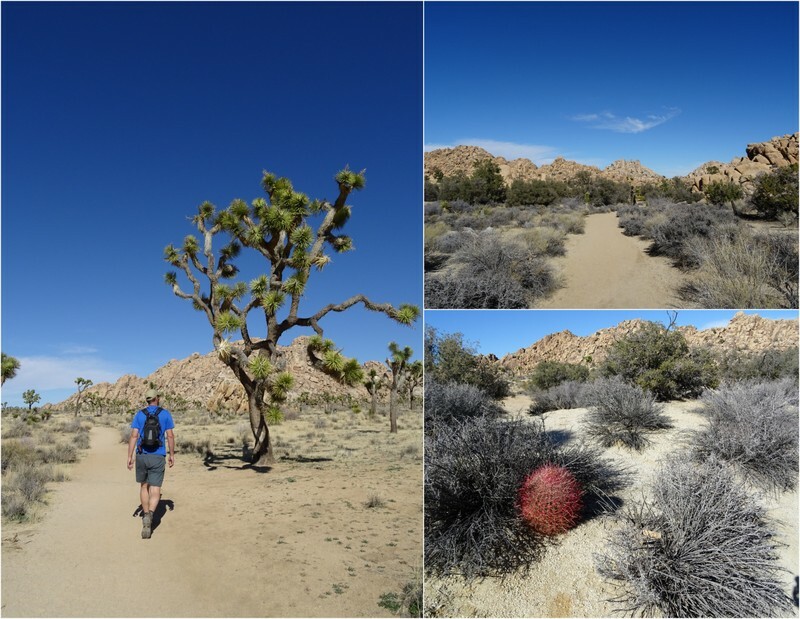 We started seeing Joshua Trees not too far past the Cholla Garden, so less then halfway through. I agree with you on the seclusion thing. When we are not in a campground we prefer to have no neighbors. Do you often run into problems with dirt roads going into boon docking spots? How do you know they are accessible? In this case we read the reviews on Campendium so we knew that the dirt road was easily accessible. If for some weird reason we can’t find any specific online info (which is rare these days) we look at the road on Google satellite view to get a feel for it. Occasionally we park at the beginning of a road and walk or ride our bikes down it to make sure all is good. So far we’ve never gotten stuck or into a position where we couldn’t turn around. 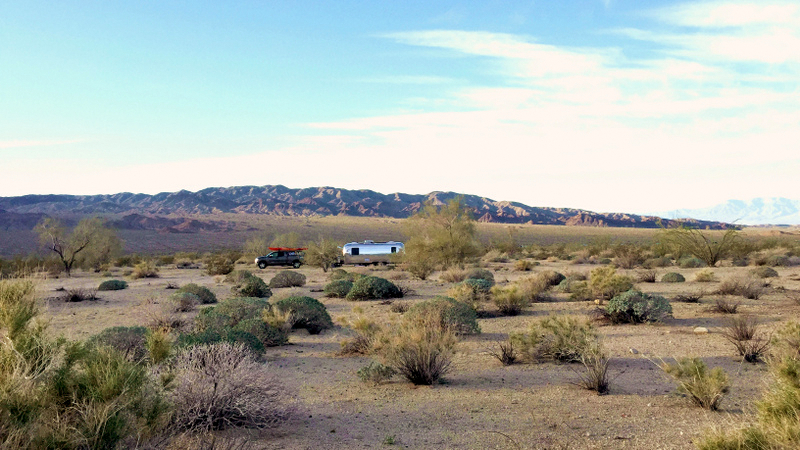 We’ve had good luck camping in the park — but your boondocking site looks pretty sweet! 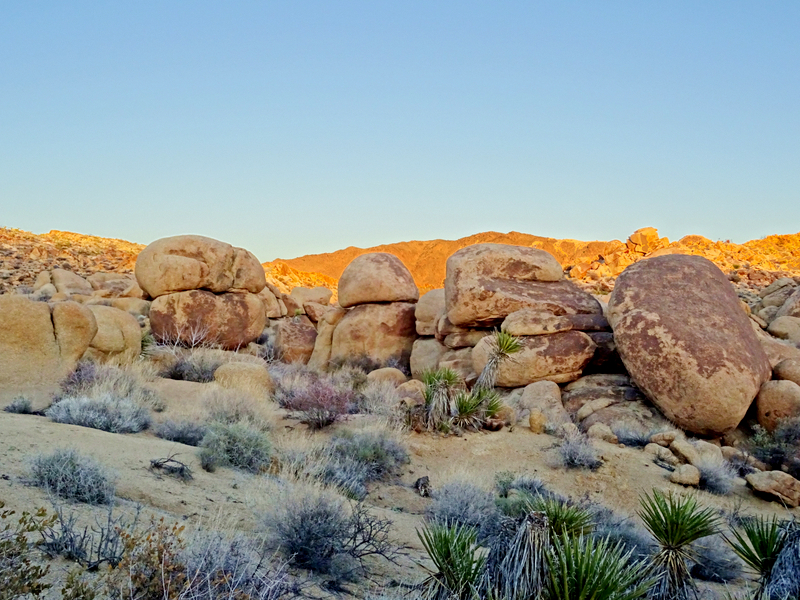 Always love those hikes among the boulders, especially when the afternoon light turns everything to gold. You captured it well in your photos. We could have gotten a spot in the park during the week, but they were all full up on the weekend. Probably because it was a holiday. Regardless, we loved our free spot! Hello, are fires allowed on the south side blm? Looks like no fires allowed on the north blm. At the time we stayed there in the winter of 2016 fires were allowed on the south side. However, regulations change often and are dependant on current conditions so I would recommend checking with the local BLM office.